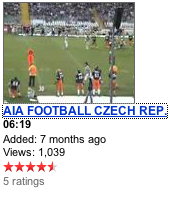 My Support/Info Video about what I do with American football here in Prague has had more than 1,000 views! Wow! That’s cool… I am taken back when I think of how small this world is because of technology and all the cool things I can do with my Mac! Anyway, click here to see all my videos that are up on YouTube and if you haven’t seen my football video here it is.